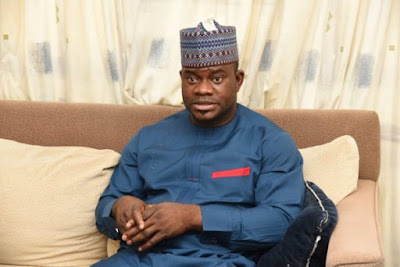 The governor of Kogi State, Yahaya Bello, has said that only “political” civil servants are on strike in his state. Civil servants in the state went on strike on September 22, saying workers were owed between two months and 21 months salaries. Speaking with journalists on Monday in Abuja shortly after a meeting with President Muhammadu Buhari, Mr. Bello said “real” civil servants are reporting to work. He also said he had cleared all the backlog of salaries he met when he assumed office in January 2016. “Those workers that are on strike are political civil servants, the real civil servants are coming to work. “There is no denying the fact that the economy is biting hard everywhere and you will recall that I met four months’ salary backlog, I cleared it and today we are keeping up to date,” he said. “We are owing August and September as we speak. “We are up to date in terms of salaries and those that come to work we shall pay them and those that don’t come to work, the no work no pay shall surely apply,” he said. Mr. Bello said he was at the presidential villa to brief Mr. Buhari on developments in his state. He said the president was pleased with the briefing. He also said Mr. Buhari encouraged him to “keep up the good job” that he was doing in Kogi state. Mr. Bello said his administration succeeded in tackling insecurity by at least 70 per cent.